How Does Getting Laid Off Really Feel? Don’t assume you are a loser. Most people are laid off through no fault of their own. I’ve been laid off, and the decisions happened from way up the corporate food chain. Since the economy is so bad, hardly any hiring managers will assume you’re a failure because of a layoff. They’ll simply assume the company you were working for had a cash-flow hiccup. Keep your resume up to date. Whenever you’ve had a big accomplishment at work, add it to the resume. You don’t want to forget it when you are out hunting for a job again. Once I found out I was laid off, I changed the end date of my job from “present” to “1/2010.” Since I didn’t have to write a resume from scratch, I was able to send resumes immediately. Live within your means when times are good. Yeah, yeah, easier said than done, but especially true after the latest economic bust. But unemployment takes a while to kick in,* it doesn’t last long, and it makes up only a percentage of your past income, depending on the state where you live. Saving up for an emergency fund can give you some wiggle room, and living on a budget means you won’t have much of a culture shock if you need to stretch an unemployment check. Don’t take any old job, unless you really need the cash. If at all possible, try to find a job that suits your skill set or teaches you something new. Otherwise, you might be stuck working for crazies who are taking advantage of desperate job-seekers, or you’ll look like a job-hopper if you move to something new too quickly. With an emergency fund, you can be choosier. Without one, you might need to get anything you can. It is not the end of the world. When an academic doesn’t get tenure, it is assumed to be the end of the world because the academic thinks he or she doesn’t have any other marketable job skills. (That’s not true, by the way.) When we Hamster Worlders get laid off, we just keep chugging until we get a new job. *Unless you’re an adjunct, which means you don’t get unemployment if you’re not renewed, which is flat-out ridiculous. 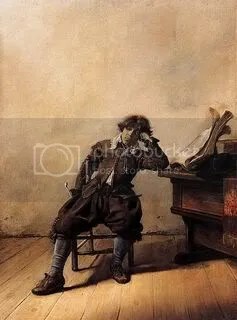 A Young Student at His Desk: Melancholy (1630-1633) by Pieter Codde Palais des Beaux-Arts de Lille, public domain on Wikimedia Commons. Subscribe to comments with RSS	or TrackBack to 'How Does Getting Laid Off Really Feel?'. Actually adjuncts can apply for unemployment (the comments in the article you’ve linked to mention this as well) – see http://www.cpfa.org/unemployment.html for more information on how to apply for unemployment, even if you’ve been offered a spot for the next year (since this can so often change). I’ve never applied, but when I was a CSU adjunct, a number of other adjuncts said that they’ve successfully received unemployment for summer and semesters they didn’t teach. It’s a very small amount, but as I learned while adjuncting, any bit helps! Thank you! This is one situation in which I am glad to be wrong. And thank you for offering a link, too. My follow-up question would be for anyone else reading–what is the process like for adjuncts in other states?